-Disposable|Heroes- • View topic - The NEW leveling statics! Post subject: The NEW leveling statics! Yep thinking of a this. With the joys of level sync, level difference doesn't matter. Job: MNK 75, PLD 60, or any other job, which are currently low. Time: usually on past 6pm EST til about 11:30/midnight weekdays, Fridays on a bit longer, sometimes. Job: PUP 69, COR 6!!! Job: RDM THF COR BLM all work, or a myriad of other jobs. Post subject: Re: The NEW leveling statics! I apologize for letting this idle for a while. I have cleared the posts in this thread to make it easier to read. I understand that our game and rl schedules often mean that we cannot do things together, so when planning things out like a set party, getting a successful group can pose a challenge. I propose that we think in terms of small groups to get passed the scheduling hurdle. These small groups would take advantage of Fields of Valor bonuses and buffs + small party exp bonus that Signet provides. 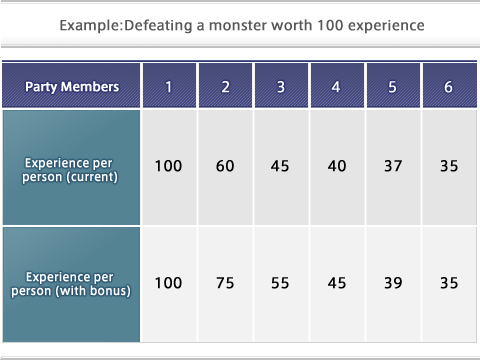 The experience earned for defeating special monsters will remain unaffected and the bonus does not apply to level capped areas. Players will gain a bonus to their defense and evasion against their auto-attack target. This bonus only applies to attacks from an opponent who you are auto-attacking with a drawn weapon and checks as Even Match or weaker. There is no effect against attacks from other sources, including links. Of course the parties can decide to level however they wish. One night they may want to fill their extra party slots and participate in a traditional party. I have broken down the people who were interested in groups based solely on time. Please forgive me Lituwotu, for not including you. Havent seen you in-game and don't know your playtime. This is just an outline of a possible solution that would cater to everyone. Perhaps some people would want to be in more than one party or none lol. Please provide input. It would be very much appreciated! I have a mental blockage that generally prevents me from putting my flag up, but if you annoy me I'd probably party on my 67 pld most any night past 830pm est (till midnight-ish weekdays), just don't make me create the party. I usually have gear and pineapple juice for it right there in my mog satchel. Times - After 6 CST during weekdays, All day weekends.